This is a very rare example of an American Clock Company of Chicago Self Winding Wall Clock (3 feet tall). The exceptional Company that made these masterpieces was asked to be, and was, an Exhibitor at the 1901 USA World's Fair. This same Company also won the Gold Medal for Timekeeping Excellence at the Paris Exposition at about the same time. 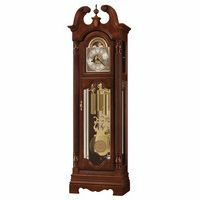 The clocks are easily identified by their unusual stick type of movement configuration, with gorgeous movements with a Skeleton Clock like look. They use only three wheels, with two weighted arms on the right side, and a dead-beat escapement. According the book 150 Years of Electric Horology, clocks made by the American Clock Company of Chicago are "some of the more cherished pieces in many electric clock collections"
.It is worth noting that the American Clock Company of Chicago, sometimes confused with other clock companies with similar names, has no relationship to them. One example is the Hamburg American Clock Company -- no relationship whatsoever! Another is the American Clock Company of New York, which acted primarily as a Distributor for other companies clocks, and occasionally put their own name on the dial -- again zero relationship. 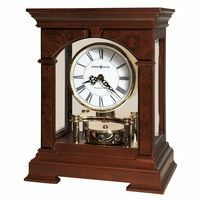 The gorgeous case is mahogany in color -- but we are not certain if it is mahogany, or a similar high quality wood. It measures 36.25 inches tall, 19.25 inches wide, and 6.5 inches in depth. The case is in very good shape, with some minor issues we want to point out for complete accuracy. The top right molding has been reattached to the case by someone, over the years, and could be better aligned (although it is not too noticeable). Also, the bottom board of the case has a slight bend to it, about .25 of an inch near the front of the case (that also is really not noticeable -- unless you open the door, and see where it meets the sideboards). Also, there is a small sliver of wood missing from the front left-hand top of the case (which also does not detract from the overall appearance of the clock). We very rarely see these very rare clocks come up for sale, much less in excellent working condition, and ready to plug in, and still yet with all of its original works, to boot. Considering its very good condition and rarity, we are sure some collector will be very happy. 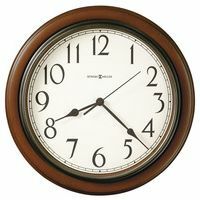 Collectors who might be interested in this clock might also collect clocks such as those of the Self Winding Clock Company, Standard Electric, Stromberg Regulators, E. Howard, Brillie of Paris, Poole, and other electric or self-winding Master Clocks, and very high-end American Clocks in general.